The section Sustainable Development Planning (SDP) is responsible for National Planning and for the coordination and formulation of the National Strategic Plan. Planning guidelines are developed by analyzing and evaluating specific themes relevant to the sustainable development of Aruba. General government policy and the prioritization of investment resources, including the general budget to implement the SDGs, are also addressed in this regard. The section SDP is responsible for the coordination, formulation, implementation, monitoring and evaluation of the National Strategic Plan (NSP) for Aruba, in cooperation with the ministries, government departments, SDG Commission, private sector and academia. It coordinates and guides short-, medium-and long-term planning addressing policy coherence between the different ministries and sectors. Periodic reports on the implementation of the NSPs are also prepared. Three NSP periodic reports have already been published on this website. Feel free to download them. The National Strategic Plan (NSP) for Aruba incorporates the economic, environmental and social dimensions of the island. The NSP process consists of coherent policies and actions which are carefully/structurally planned and implemented. This planning process is also monitored and evaluated. One of the responsibilities of the government is to facilitate and stimulate sustainable development. Therefore the government should formulate goals and policies, and plan the necessary activities in consultation with the private sector, NGO’s and the civil society. The need to continuously access current and future challenges with efficient and effective solutions will be critical for the government to maintain a sustainable development in Aruba. Due to the small scale of Aruba, there are many challenges to achieve sustainable development, since economic development has to be kept in harmony with the (limited carrying capacity of the) environment and the social cohesion of Aruba. Apart from the economic challenges such as economic growth, the creation of new jobs and the absorption of the increasing expenses due to the aging population, strengthening of the social security (package) remains central in the government’s plans and policies. The accessibility to healthcare must be improved as well as the overall efforts towards an efficient government system. 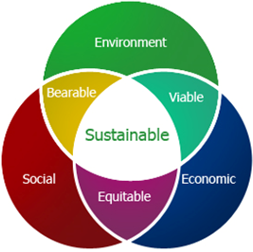 These are all vital aspects for stimulating coherent policies regarding sustainable development. SDP also gives advice on matters related to development cooperation and assistance between the Netherlands and Aruba, which mainly regards the financing of programs and projects. However there are currently no funds available coordinated by DEZHI for this purpose. Aruba is associated with the European Union (EU) as part of the Dutch Kingdom. As a result, there is a relationship between the EU and Aruba as an Overseas Country and Overseas Territory (OCT), which is regulated in the OCT Decision or decision on the association of the Overseas Countries and Territories with the EU. The OCTs are organized in OCTA (OCT Association). The OCT decision aims to facilitate economic, cultural and social development and the strengthening of the economic structures of the OCTs. This should be done in particular by the development of trade, economic relations and agricultural and industrial cooperation between the EU and the OCTs, and by contributing to safeguarding the interests of these OCTs, whose economy depends to a considerable extent on the export of raw materials and implement measures in the field of technical cooperation. The European Development Fund (EDF) is intended for the African, Caribbean and Pacific States (ACP) and OCT countries and is managed by the European Commission’s Directorate General for Development Cooperation (DG VIII) in Brussels. The EDF is fixed for a period of five years. Currently the OCT Decision is being revised and therefore an evaluation is taking place for the Post 2020 period. The eleventh EDF rans from 2014 to 2020 and amounts to € 30.5 billion. SDP coordinates in this context the preparation of programs, projects and policy for Aruba regarding the cooperation with the European Commission (EC) and the EDF for National and Regional programs. Under the eleventh EDF € 13 million is earmarked for the National Program and is destined for the SISSTEM Faculty of the University of Aruba. The Regional programs under the 11th EDF are divided in the EDF Regional Program which amounts to € 40 million and the Thematic Program for € 17.8 million. Another financing source is the Horizon 2020 Program, which is a European subsidy program for Research and Innovation in Europe. Horizon 2020 is the successor of the Seventh Framework Program (FP7) and runs from 2014 to 2020. The total size of the program amounts to more than €70 billion. The program offers opportunities for every organization or entrepreneur that is active in research, technological development and innovation in an international context.